Step out of Olympic National Park to go to Joyce and see Joyce Depot Museum, which is approximately 1h 10 min away. There's much more to do: take a memorable drive along Hurricane Ridge, hike along Second Beach Trail, tour the pleasant surroundings at Ruby Beach, and admire all the interesting features of Olympic Peninsula Loop Drive. To see maps, traveler tips, other places to visit, and tourist information, use the Olympic National Park trip itinerary maker site . Seattle to Olympic National Park is an approximately 4.5-hour combination of ferry and bus. You can also take a bus. Plan for little chillier temperatures traveling from Seattle in May, with highs in Olympic National Park at 62°F and lows at 46°F. On the 1st (Sat), wrap the sightseeing up by early afternoon so you can travel to Seattle. To find more things to do, photos, traveler tips, and other tourist information, go to the Seattle trip itinerary builder site . You can do a combination of bus and ferry from Olympic National Park to Seattle in 4.5 hours. Another option is to take a bus. Prepare for a bit warmer weather when traveling from Olympic National Park in June: high temperatures in Seattle hover around 74°F and lows are around 57°F. 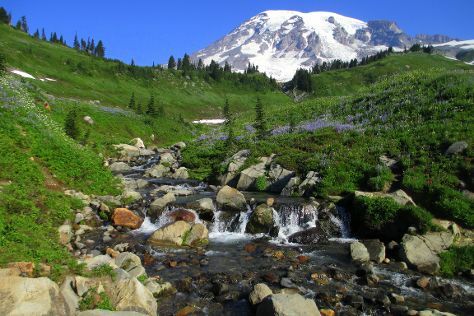 On the 2nd (Sun), you'll have the morning to explore before heading off to Mount Rainier National Park. Step out of Mount Rainier National Park to go to Eatonville and see Northwest Trek Wildlife Park, which is approximately 1h 10 min away. Next up on the itinerary: take your sightseeing to a higher altitude at Mount Rainier, explore the activities along Nisqually River, admire the sheer force of Narada Falls, and contemplate the geological forces at Mount St. Helens. To see other places to visit, traveler tips, more things to do, and more tourist information, refer to the Mount Rainier National Park trip itinerary site . Explore your travel options from North Cascades National Park to Mount Rainier National Park with the Route module. In May, plan for daily highs up to 67°F, and evening lows to 46°F. Wrap up your sightseeing on the 3rd (Mon) to allow time to fly to Olympic National Park.